Do you have a doll with matted, overly fuzzy, "ruined" hair? We did. 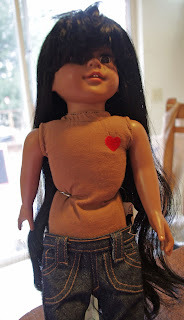 With the help of some nice ladies on a Yahoo doll e-group and a google search, we learned to re-wig dolls. It costs much less than a trip to the doll hospital. And, although a bit unnerving for Allison, (She doesn't like to see her dolls bald.) it's fun, too. We also learned how to restore the hair. 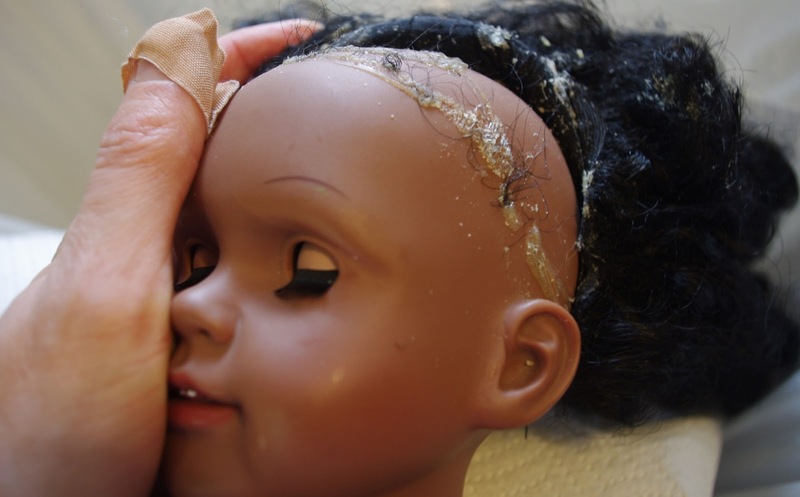 If your doll's hair is a bit unruly, try this tutorial before re-wigging. 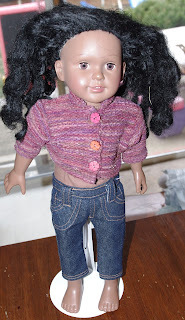 Some of Allison's dolls' hair responded well to this restoration treatment. For a couple of the dolls we added the use of a large barrel curling iron on the lowest setting to give a final straighten. Be careful with a curling iron. This hair can melt! 1. Lay paper towel over the trash can to keep your doll clean. Lay or doll over the paper towel. 2. Remove the hair. 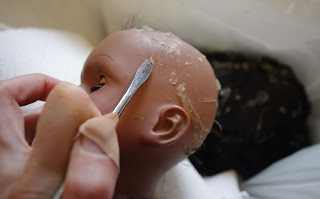 Some dolls, like this one, have a wig to peel off. Others have rooted hair to cut off. Either way remove all of the hair. 3. Scrape off residual glue. Be careful not to slip and cut yourself with your scraper. 4. Try the new wig on your doll a couple of times to "rehearse" wig application. 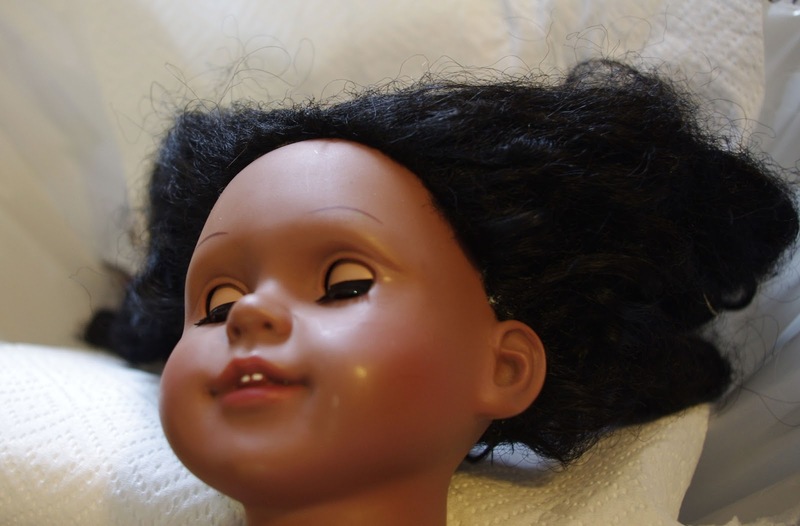 Turn our wig inside out and put it on the doll. I was so excited about the process, I forgot photos of the next two steps. 5. Put new glue onto the head. Any craft glue works. I like all purpose adhesive types. You can follow the hair line path from the old wig. 6. Tie back the new wig's hair to keep it out of the glue. Turn the new wig inside out. Starting with the front, lay the new wig on over the glue. Adjust the wig so it's centered. 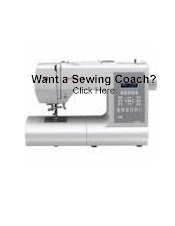 Depending on your glue type, you may need to work quickly. New Hair: Needs a trim! 7. 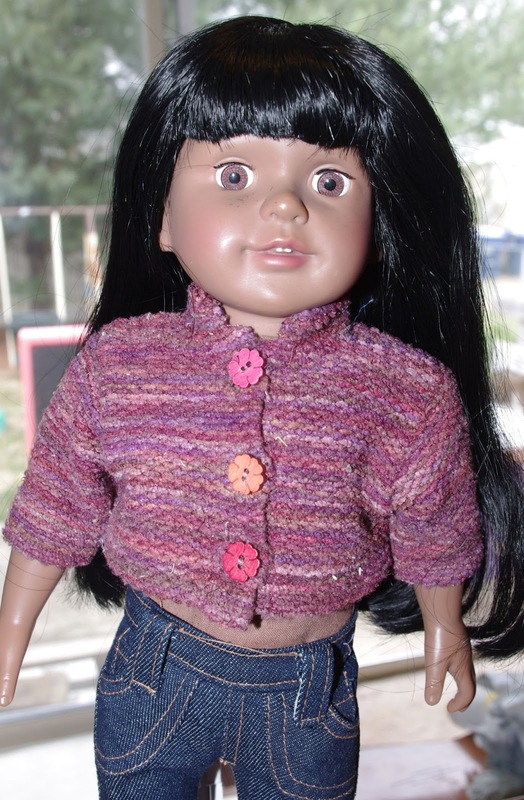 Use household scissors (not hair scissors) to trim your doll's hair as desired. Remember this doesn't grow back, so less is more. Your doll's new hair! And one happy little girl! Awesome! Thanks!! She looks super! !